It’s that time of year again: Viking Member Night! 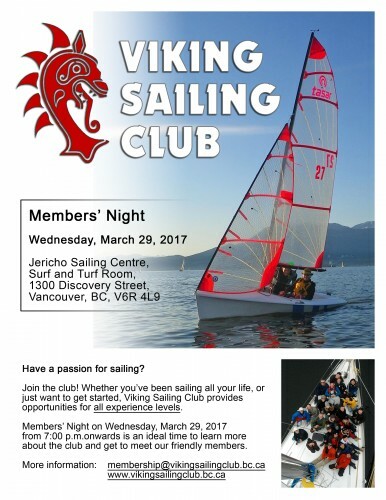 Join us on March 29, 2017 from 7:00 -10 pm at the Surf & Turf Room, Jericho Sailing Club: 1300 Discovery Street in Vancouver, BC. There will be food, nibbles, silly photos and lots of talk about sailing: how to do it, how to do more of it, and how to get psyched for the 2017 sailing season! If you are a brand new Viking or want to be a Viking, this is a great opportunity to get your questions answered to meet your future sailing partners! Feel free to invite others to our Members Night via our Facebook event page as well.